With a career spanning thirty-three years, Douglas Blonsky has helped bring this world-famous landscape from the brink of destruction to its current glory as New York City’s chief oasis of nature and recreation. Hired by the Conservancy’s founding president Elizabeth Barlow Rogers in 1985, Blonsky served as manager of the public-private partnership’s first carpentry and masonry restoration crew and subsequently as head of its office of landscape design and construction. 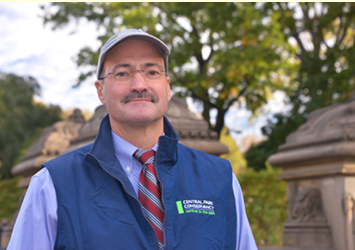 In 1998 he became the Central Park administrator, a Parks Department position, and in 2004 he was selected to occupy the dual role of park administrator and Conservancy president / CEO. Upon his retirement announcement last June 6, his record of accomplishment was recounted in the New York Times in terms of highest praise. Fortunately, Blonsky will still be on hand as an advisor to the Conservancy-run Institute for Urban Parks. As he transitions seamlessly into this new role, he says, “I am excited about sharing what the Conservancy has developed and learned over the past thirty-eight years with parks locally, nationally, and elsewhere throughout the world."